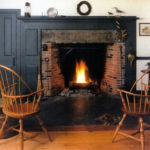 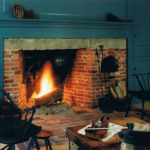 We build classic brick reproduction Rumford Fireplaces. 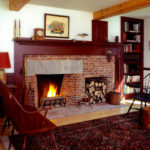 These fireplaces are built with cut-brick corners and beaded grapevine joints. 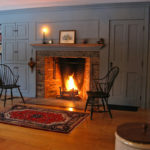 They can include wrought iron cooking cranes and traditional bread ovens. 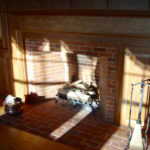 48″ Brick Rumford, Weathered Granite Lintel, Flush Single Piece Schist Hearth, Wrought Iron Crane. 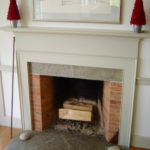 48″ Brick Rumford, Weathered Granite Lintel, Flush Schist Flagstone Hearth. 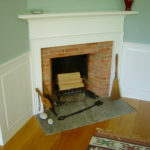 42″ Antique Brick Rumford w/stone Lintel, woodbox, and flush brick hearth. 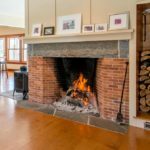 48″ Antique Rumford with flush brick hearth and small bread/pizza oven.